Varalakshmi Vratam/Pooja is a popular ritual observed by married women in South India and Maharashtra. It is performed by married woman for the well being of all the family members, especially husband, to get progency etc. This was my first Varalakshmi Amman(2012). Varalakshmi literally means the boon granting Goddess and 'Vratham' means a strict observance of certain rituals and practice. Worshipping Goddess Lakshmi on this day is equivalent to worshipping Ashtalakshmi – the eight Goddesses of Wealth(shri), Earth(bhu), Learning(saraswati), Love(priti), Fame(kirti), Peace(shanti), Pleasure(tushti) and Strength(pushti). The Hindu festival going by the name 'Varalakshmi Vratam/Nonbu' is celebrated on the friday before the full moon in the month of Aadi(Tamil)/ Sravana(Telugu) / Sawan(in Hindi), which corresponds to the English months of July–August. This year, Varalakshmi Puja falls on Friday , August 24th 2018. According to Hindu mythology, once goddess Parvati asked Lord Shiva to recommend a vrata that will be beneficial to women. Lord Shiva then mentioned the importance of Varalakshmi vrata. The glory of performing the varalakshmi vratam, narrated directly by Lord Shiva Himself, is elaborately discussed in the Skanda Puranam. To illustrate the importance of the vrata, Lord Shiva narrates the story of Charumati. Pleased with Charumati’s devotion to her husband and family, Goddess Lakshmi appeared in her dream and asked her to perform the Varalakshmi vrata on the auspicious day of shravana shukla shukra varam.The pious Charumati invited all her neighbors, friends and relatives and performed the Varalakshmi pooja as directed by Goddess Lakshmi. Soon after the pooja, all the people who participated in the pooja where blessed with wealth and prosperity. Below is the procedure to perform Varalakshmi Pooja. I have listed it in the order for easy understanding. Start the pooja early and finish it before Raagu Kalam (in-auspicious time) or start the Pooja after Raagu Kalam. Avoid performing the pooja during Raagu Kalam. Fasting begins on friday morning(Sunrise) and ends when the Pooja is completed. If in case if your having periods on that day you are not advised to do the pooja. Instead, you can do the pooja on the coming week (friday). If you have missed or failed to observe the varalakshmi pooja on that day, you can do it during the following friday or observe it during a friday during Navarathri festival. There are no hard and fast rules in performing the Varalakshmi Pooja and you can be flexible on the pooja items. Even a simple prayer will please Goddess Lakshmi. # On the day previous of the pooja, clean all the vessels used for pooja (Kalasam, Kuthu vilaku, Panchapathiram, amman mugam etc). # Draw “maakkolam” inside & outside the mandapam to “ invite amman”. # In the evening decorate the Pooja mandapam suitably. Pooja mandapam or Amman should face East. # The next day(friday) morning amman will be brought to this mandapam. Kalasham (a sacred pot) means a pot to carry water. Brass or silver kalasham is usually used for poojas. Kalasham symbolically represents the Goddess in most poojas. Kalasham is a must for performing any kind of Pooja. Vratam can't be performed without a Kalasam. You are inviting the god or goddess to that place and performing pooja directly to it. # Clean the kalasham through and make it dry. Decorate it with sandalpowder and Kumkum dots. # The kalasham is filled with raw rice or water, coins, a single whole lime, five different kinds of leaves, and beetle nut. # The kalasham up to the neck is sometimes covered with a cloth and mango leaves are placed on the mouth of the kalasham. Ensure that the end tip of the mango leaves point in the upward direction. # Finally, a coconut(unbroken) smeared with turmeric, decorated with kumkum and sandal wood paste is used to close the mouth of the kalasham along with mango leaves. The eyes of the coconut / Kudumi should be upward. # To this coconut, an image of goddess Lakshmi is fixed or the image of Lakshmi is drawn using turmeric powder. You can also tie un-stiched cloth around the pot (optional). 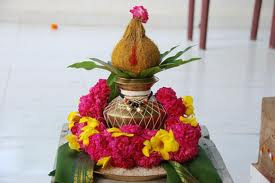 # The coconut and kalasham form the body and we further decorate it by tying special clothes (pavadai) and jewels to the deity. Decorate the pot with garland or flowers. Now the kalasham symbolically represents Goddess Lakshmi. # If you are using the jewels which you have worn, wash them before decorating the kalasam. Now keep this decorated Kalasham over the rice on the plate. Put a small garland & light a lamp near Amman. Next day(friday), have a head bath & it is traditional to wear a saree. In the entrance of the house, put a kolam, keep a palakai facing east & keep the decorated Kalasham. Invite Amman by singing "Varalakshmi Raave Maa Intiki". The women of the house welcome the Goddess into their homes with this invocation song. Then bring the Amman on the Rice-plate inside the house & keep it inside the mandapam. Goddess Lakshmi is invoked. Fresh flowers and grains are used in the worship, indicating growth and prosperity. Make a cone shaped turmeric Ganesha – manjal pillaiyar by mixing turmeric powder & few drops of water. First Lord Ganesha is worshiped(seeking removal of all obstacles). The yellow thread (saradu) is prepared with nine knots and a flower is placed in the center. Keep it near the kalasham. Arati is performed on the kalasham. Then begins the Varalakshmi Pooja. The pooja consists of singing slokas dedicated to Goddess Lakshmi like the Lakshmi Sahasranamam, Lakshmi Ashtotram and Amman Potri's (108). Chanting of shlokas, mantras of Lakshmi, and singing various hymns and devotional songs in praise of the Goddess are the main highlights of the day. Here is a collection of some beautiful compositions in the praise of Mahalakshmi. 1. Maha Lakshmi Karuna - This song salutes the Goddess for her beauty, charm, compassion and golden heart of kindness. 2. Bhagyada Lakshmi Baramma - This enthralling poetry imagines Goddess walking with fully decked jewellery, her anklets making sweet sound and her hands offering infinite wealth. 3. Varalakshmim Bhajare - This composition recognizes Goddess as the ocean of compassion and appeals to forgive all the sins/mistakes. 4. Gowri KalyaaNa Vaibhogame - This is a traditional marriage song which praises the marriage celebration of Gowri and Lakshmi. This is also sung when culminating any festival or Pooja. Finally, tie the yellow thread around the right hand of the performer and all other ladies in the family. Fasting is done from morning till Varalakshmi Pooja is over. In some regions, women fast till the pooja period. You can always be flexible – fasting might not be possible if you are pregnant / under medication etc. # The woman who is observing the Varalakshmi Puja abstains from eating certain kind of food and this varies from region to region. Odd number of dishes must be performed for the neivedyam/ prasadam. Starting from 1, 3, 5 or 9. The Prasadams prepared on the day of the pooja are Kozhukattai, Sundal, Sarakarai pongal, Vadai, Aappam, Payasam, Kesari, Laddu. # Thamboolam (betel leaf, areca nut, bannana, bangles, kumkum, turmeric, prasadam, blouse piece etc) is offered to sumangali in the evening and arati is offered. # The next day(Saturday), after taking a bath and do simple Pooja. At the end of the pooja we pray to the deity to come again, just as we tell guests to our house when they leave. Punah pooja is not necessary when we are using the same image permanently for the pooja everyday. That night, it is customary to keep the amman in arisi panai(Rice Pot). You can dismantle the Kalasham the following day of the pooja. # In case of face made with Sandal or turmeric, you can put it in the pond of the temple or river. # The rice in Kalasham can be mixed with the normal rice that you use in your home. 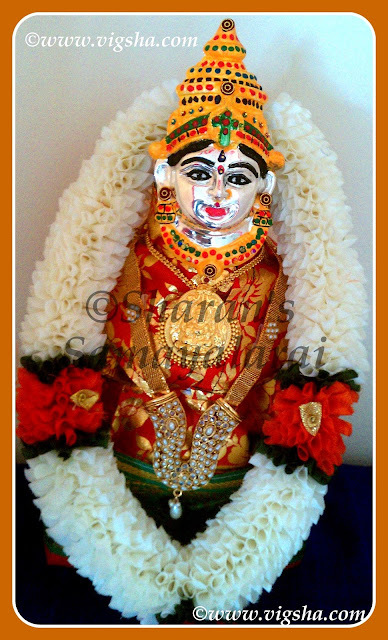 It is believed that Goddess Annaporni stays in the home permantently. # Normally in India, the items in the kalasham are put inside a freshly made hole in the ground. # Coconut after the pooja is like any coconut that can be used in cooking. # Do not impose the Pooja. You should observe it only, if you are really interested. Also do not impose the pooja on youngsters. # Don’t worry if you miss a small step while doing pooja, like agarbatthis not lit. What matters is your interest, love, dedication and concentration. # If you are observing for the first time, learn it from an experienced woman. # Unmarried women observe the pooja, if their mother is observing it. # Pregnant women can skip the fasting. If you are so inclined you can do it but make sure fasting does not cause any harm. You can do the pooja and skip fasting. If the pooja falls within 22 days of the birth of child, it is considered inappropriate and should not be observed. # It is important to honor the priest who conducts the pooja. After the pooja, offer him thamboolam, prasadam & dakshanam. If you are doing the pooja on your own, set it aside to be given to any elderly person later. Disclaimer :- I have gathered all these information from family, friends and many Hindu websites. I do not make any representation or warranty with respect to accuracy, applicability or completeness.